A little over three months since Samsung unveiled its new lineup of televisions to the world at CES in Las Vegas, Samsung has confirmed which models it will be launching in Australia. 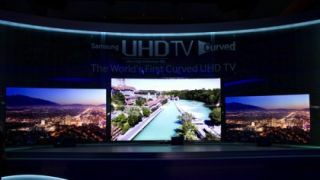 Anybody holding out for that 105-inch curved Ultra HD 4K behemoth is destined for disappointment though, with Samsung execs instead focusing on the 78-inch Series 9 HU9000 model as its domestic flagship. Likewise, anyone in the market for a shiny new OLED panel will be left waiting, with the company doing its best to convince everyone that curved Ultra HD LCD screens are the future. In fact, OLED didn't even get a mention during the evening's presentation, a far-cry from the innovation message Samsung was sending at the launch of its 55-inch S9C panel last year. One part of the CES presentation that didn't make it over to the Australian launch was any form of content partnerships to take advantage of those UHD panels. While CES was filled with news about 4K content coming from the likes of Amazon Instant Video and Netflix, there was a lot less info (or more precisely, none) about Australian 4K content deals. Instead, the message was that buying a curved UHD TV now was a way of future-proofing your viewing habits, especially thanks to the Samsung Evolution kits that allow you to upgrade the specs of your TV annually. The good news for anyone looking to buy a new television is that Samsung's new range is huge. Prices go as high as $16,999 for the 78-inch curved UHD Series 9 display, with 65-inch and 55-inch variants costing $6,999 and $4,999 respectively. The Series 8 range comes in both flat UHD models ($2,999 for 48-inch, $3,999 for 55-inch and $5,699 for 65-inch) as well as curved HD models ($3,799 for 55-inch and $5,699 for 65-inch).